The Greenlite PC is a home computer designed to run home and office applications without the huge energy consumption. 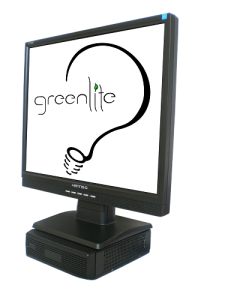 The Greenlite PC measures just 7.5″ x 8.5″ x 2.5″ (the box under the monitor) with an average power consumption of 26 Watts, or 31W at peak. The system can be pre-installed with either Ubuntu Linux or Windows XP, where the latter attracts a licence fee of an extra $100. A standard system has a 1.6GHz processor, 2GB of RAM, 160GB internal SATA disk, WiFi and Ethernet, a soundcard, internal or external DVD drive, Keyboard, Mouse and Speakers. 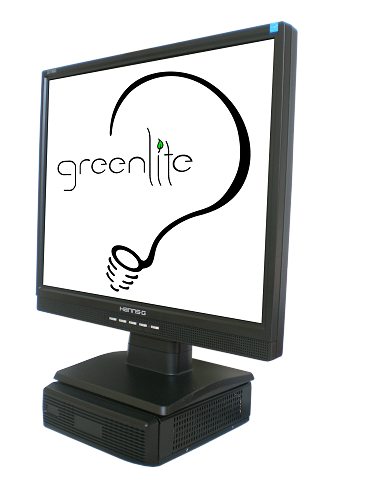 The price for the GreenLite PC with Ubuntu Linux is $499, and $599 for the GreenLite PC with Windows XP.